I’ve seen lots of postings about designing/building your own power sources using 18650 cells. Being lazy (and not terribly mechanically gifted), I was looking for an easier way, one that would allow me to use the ubiquitous inexpensive off-the-shelf 5V powerbanks. There was a previous post by Tommy SA2CLC, who was kind enough to even send me some blank PC boards for a power booster. But again, I’m not terribly gifted in such projects, so I kept looking. I have found a first solution with the Adafruit Model 2778. I love the idea of being able to pick up a cheap powerbank to use with my MTR-5b with the help of this very cheap ($US 6.50) cable. There is also a 9V version available (Model 2777). The cable is rated for 500 mA, but the factory got 700 mA out, and I’ve been getting 960 mA out during initial tests using an MTR-5 and a dummy load. Note: when I used the powerbank/booster cable with my KX2, the rig shut down the second I started to transmit due to insufficient current. One key thing to be aware of is that the cable/MTR setup does not work with every powerbank. Some of them switch off if the load draws too little current. On receive, the MTR5b from LNR is spec’d to draw 30 ma @ 6V and 20 ma @ 12V. On my tests with a KD1JV 5b kit, the rig/12V converter cable setup was drawing an average of 60 mA from my powerbank. This was adequate to keep my Varta powerbank turned on during receive, but my larger Voltcraft powerbank turned off after just a few seconds of receive. Note that one workaround is to add a device such as the Sotabeams “USB battery pack keep-alive load” – but it’s not really practical for outdoor use. Find great deals on SOTABEAMS for USB battery pack keep-alive load. Shop HF and VHF Portable Antennas and Accessories for Amateur Radio/Ham Radio with confidence. Here is a photo of my test setup with a dummy load; field trials to follow shortly. I have the MTR5b in Tune mode (continually sending a carrier into the dummy load). You can see that the MTR is detecting an input voltage of 11.6V (lower right display). The current draw in Tune mode was 0.96A (as measured with a LogiLink Model PA0067 1-Port USB power meter). I left it running for a good 15 seconds continuous. I was wondering if I would get QRM from the converter module, but there was no discernable difference in noise from the powerbank and a LiFe battery. I was also concerned about chirps in my signal, but I monitored transmission into the dummy load from my desktop xcvr and heard no difference from the powerbank to the battery. Thus far the results are encouraging, next are the field tests. If you hear me on the air in the near future, please give me accurate signal reports (I won’t be offended if you give me a 595C). Instead of running a radio directly, these boost converter cables look like they would be useful for charging small 12V lithium packs, such as those we use in the KX2 and similar radios. Based on Adafruit’s testing, it would take 6-8 hours to charge a 12V battery in the 2500-3000 mAH capacity range, using the boost converter cable running from a 5V power bank. It’s not really a plug-and-play charging device, although it might work. It would be good to add metering and current limiting, so it would be a small project to make a reliable, safe charger. The voltage output looks to be just about right for a 3S lithium ion or LiPO battery. Limiting the current to 500 MA or less would be smart. With charging there’s no problem about the auto-shutoff of the 5V power bank. It would be a good feature and would terminate the charge before the battery was topped off. This is probably a good idea when charging overnight, camping, etc. Most of the larger 5V power banks have two or more USB outputs, so it seems that you might be able to run TWO of these boost cables as chargers simultaneously, so you could charge two KX2 batteries at one sitting. The larger banks have enough energy to do this, based on the numbers available. The 5V bank would shut off once the energy is down too low - they offer self-protection from over-discharge. Has anyone tried these boost cables for this? Or similar? i have a similar setup for the smaller MTR3b … i have 2x powerbank that gives out 1A max from the USB port. i originally just wired them both serially, but the powerbank turns off after a few minutes. same as your observation. MTR3b RX power draw is a measly 30mA, according to specs. on a trip to Akihabara i bougth some DC boost boards based on the X​L​6​0​0​9 chip [Japanese warning DCDC-XL6009]. works like a charm for me. the board has an accesible VR so i adjusted the Vout to about 9.4V (this is a magic number since i have a number of Mizuho pico TRX that also want <10V). the converter also seems to be quiet in my case (i had the luxury of using cable lengths as short as possible). Some hams have speculated that the dc/dc converter in the Adafruit cables would create spurious emissions larger than those allowed by the FCC (-43 dB). I wanted to investigate this point, but I don’t have a spectrum analyzer at home, much less a high-quality instrument. Thus, I turned to my friends at a special department at the University of Applied Sciences in Rapperswil, which also has a ham radio club HB9HSR. This department, which provides university-industry cooperation and consulting, is the Institute for Communication Systems (ICOM, www.icom.hsr.ch), and obviously has a fully equipped lab for performing radio experiments and research. Special thanks to Nicola HB9FIM who knows how to make these instruments dance – he needed just minutes for tasks that would have taken me days to figure out. I took my MTR-5b along with a 3S LiFePo battery as well as a powerbank along with the Adafruit 9V and 12V booster cables. We used a Rigol DSA875 spectrum analyzer (9 kHz - 7.5 GHz), which accepts a maximum signal of +20 dBm. 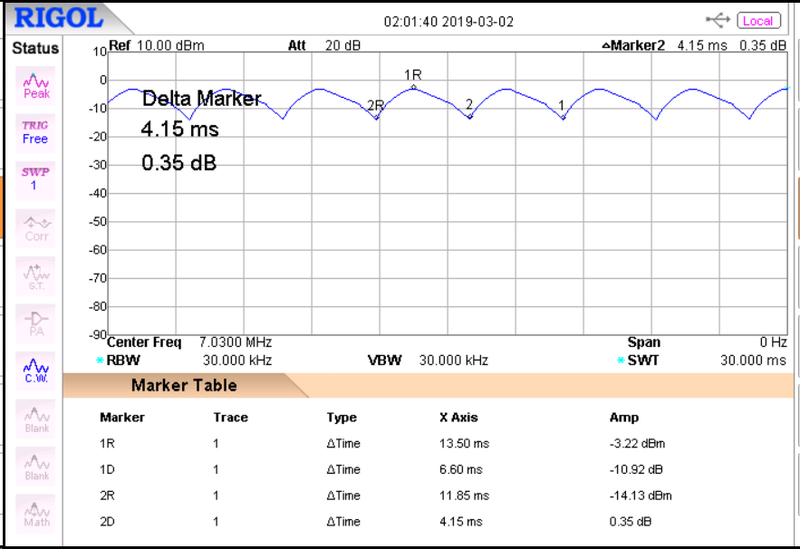 Because the MTR 5b has a max output near 5W, we added 40 dB of inline attenuation. Test 1: Spectral purity of the MTR-5b in Tune mode when using the battery. The fundamental frequency was 7.030 with a signal level of -4.49 dBm. 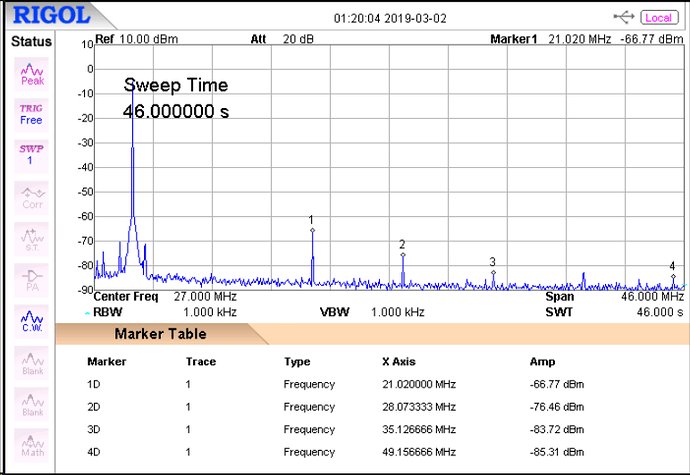 I was pleased to see the largest spike (at 21.020 MHz) was down 61 dB – far below the -43 dB required by FCC Part 97, Para. 97.307(d). Test 2: Spectral purity of the MTR-5b in Tune mode using a powerbank (Varta Type 57961, 4x2500 mAh) and the Adafruit Model 2777 9V boost converter cable. Would the dc/dc booster create spurious signals? Actually, not at all – the output was just as clean as before, we could not see any noticeable difference. Test 3: Same as Test 2 but with the Adafruit Model 2778 12V booster cable. Here we again noticed no increase in spurious emissions. However, to our surprise we saw that the output voltage was oscillating up and down. The voltage trace under load – the attenuator – looked like the following curve where the peak-peak Tx power variation is 10.92 dB, i.e., the output power goes from 4.7 W (-3.22 dBm + 40 dB) down to 0.39 W (-14.13 dBm + 40 dB) and up again within 4.15 ms => 240 Hz. We also examined the output of the 12V cable with an oscilloscope; unfortunately, we did not take any images. In the no-load case, we saw a sawtooth ripple voltage of approximately 100 mVpp at 142 Hz. When we loaded the booster cable with the transceiver pushing its output power into the attenuator, we saw some ripple – a combination of the slow oscillation and fast spikes from the dc-dc converter’s switching circuitry, where the spikes had a repetition rate of 1.7 MHz. These ripple components did not cause any problems because they have levels far lower than the largest existing spike at 21 MHz and they are not clearly identifiable on the spectral diagram. Even so, transmitting a signal that varies in peak amplitude by so much is not optimum – we’re not looking for amplitude modulation! Conclusion: Powerbank/Adafruit 9V option is viable, the Adafruit 12V option is not. This would be consistent with your observation (fine at 9V, ripple at 12V). To do ‘full power’ measurements on 12V, try setting up Straight Key mode and then do a key down. In this case the SWR protection from Tune mode is not active. Well, based on this info about Test mode, I ran some additional tests and observed the resulting behavior on my “antique” Tek TDS210 scope. Thus, if the booster draws 1.21A @ 5 V from the powerbank, we can surmise that the booster outputs approximately 400 mA @ 12.1V, which is below the 500 mA limit – great news!! 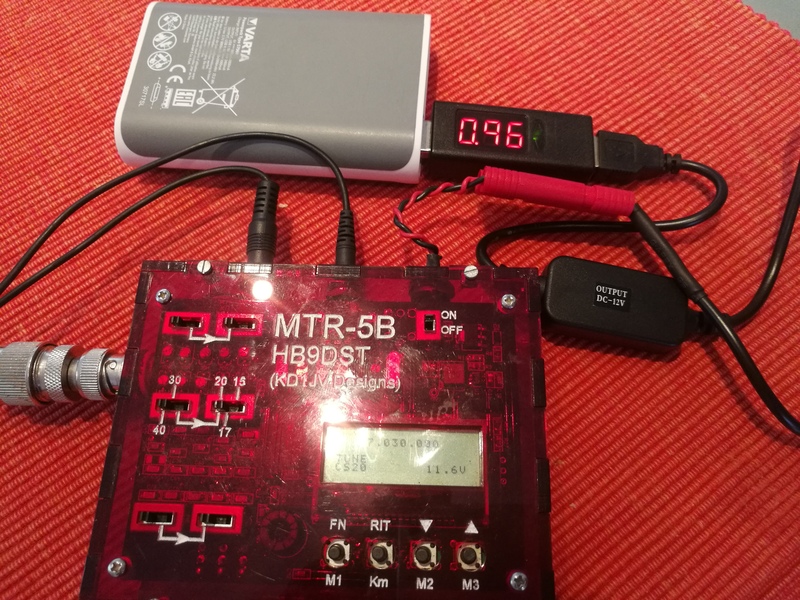 Conclusion: Both the Adafruit 9V and 12V booster cables – when used with an off-the-shelf commonly available powerbank – are viable for use with MTR series rigs.